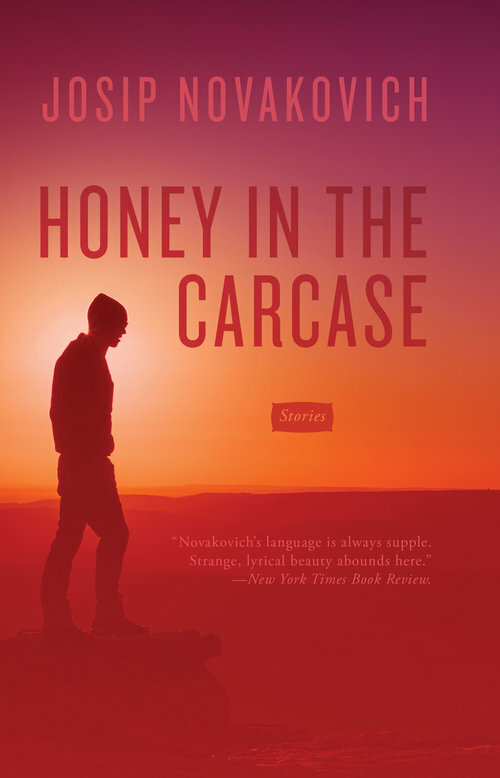 The following is from "Yahbo the Hawk," a story from Josip Novakovich's collection Honey in the Carcase. Josip Novakovich has received the American Book Award from the Before Columbus Foundation, the Whiting Writer’s Award, and a John Simon Guggenheim Memorial Foundation Fellowship for Fiction, as well as a fellowship from the National Endowment for the Arts. 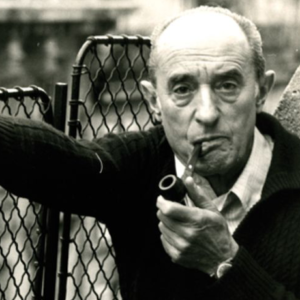 His work has appeared in The Paris Review, Threepenny, and Ploughshares, and has been anthologized in Best American Poetry, The Pushcart Prize, and O. Henry Prize Stories. Instead of to the church, I walked one Sunday morning to the nearby park. Just as I was about to climb an oak, I saw my friend Peter walking down the path beside a grim partisan monument. Peter used to lead Catholic funeral processions, holding a varnished cross, dressed in white vestments, his checks pink in the wind or the heat, while a priest sang in monotonous Latin. I respected Peter for his knowledge of Latin, which still did not prevent me from cornering him in our classroom and punching him like a boxing sack. I rented him for that purpose, a dinar for ten minutes of practice. Peter now carried a covered pleated basket. “What have you got there?” I asked him. I gave him a bronze dinar coin and peeped in. And he pretended he would walk on. We walked to the sweets shop. I bought him three ice creams and he lapped them like a cat drinking milk. Then he took out one hawk. I gripped it to make sure its talons, small Turkish sabers turned upside down, could not reach me. I was uneasy about the beak. I searched through my pockets, and in the mess of nails, wires, cigarette butts, and several round pebbles for throwing at traffic signs and teacher’s windows, I found one torn red piece of paper with a picture of a muscular factory worker on it. I rushed home with the hawk in my hands, held far in front of me. The hot bird pulsated with fast heartbeats; its whole body was one big heart with sharp edges and eyes atop its valves. As soon as I got home, I put it into a cupboard, stole some money that was kept in a prayer book to ensure divine protection, and ran back to the sweets shop. “All right, this is for the deposit!” I gave him a black eye, to which he responded by giving me a wonderful show of the firmament, with more stars than there are sons of Abraham, Isaac, and Jacob—a black eye of my own. In all fairness to the art of painting, which takes time, I must say that his eye was not yet black but red and purple, the following day it was green and yellow, and on the third day it was blue. Now I knew that you could get green out of blue and yellow, but that you could get blue out of green and yellow was a novelty, and it was not an exception proving the rule, because the area surrounding my eyes followed the same revolutions of color as his. In the end our colors were dark blue, like the most common sort of plums. Ashamed of my plum-eye, for four days I joined the pirates, wearing a greasy strap of leather across my head. At home in the attic, my hawk’s new home, I waited till my eyes would get used to the darkness. I made out the bird’s silhouette on a crossbeam; it was emerging from the dark, like a picture developed in a lab, sharper and sharper. It turned sideways toward me. When I began to approach the silhouette, it jumped and flapped its wings unsteadily to another beam. It nearly fell from the beam onto the bales of cowhide that my father had used for making clogs before his death. Along the walls of the attic, there were piles of wooden soles; newspapers and magazines, some with pictures of Russian spaceships and dogs, and one of Marilyn Monroe with her lips parted; jigsaw puzzles with missing pieces; and a flat leather soccer ball. I christened the hawk Yahbo, a man’s name, feeling like Adam in paradise naming the animals. I was not sure what Yahbo’s gender was, though I wanted to think of him as male. Still, I didn’t ruffle through its feathers to find out, fearing that afterward I’d have to rely only on my sense of touch, the beak and talons making my eyes flutter at the thought of coming close to them. In the back of the attic, sunshine streaked in, stronger and stronger, and particles of dust were brilliant, burning like stars in a downward Milky Way. Through the window, facing east, you could see the mountains and forests from which Yahbo must have come, from a no doubt very noble lineage stretching all the way from the Garden of Eden and God’s breath. If He made Adam of soil, He made hawks of leaves, detached leaves that winds carried aloft; with God’s breath reaching them, the leaves ceased to be the helpless toys of the winds, and instead the stems evolved into seeing heads, and the outer edges into wings. And so came into being the great surveyor of forests, from the leaves’ soft riblets. I brought him water to drink. But he would not drink. I fed him liver meat, a quarter of a pound. I paid attention that it be bathed in blood because otherwise he would not get enough liquids. It was hot in the attic. Several days later, Yahbo sat on a crossbeam and stared. White film was covering his eyes, slowly, and withdrawing back somewhere beneath the hairs around his eyes. His beak was half open. He is dying of thirst and grief, I thought. I went to the library to find out whether young hawks drank water, or blood only, and I wasn’t able to find anything on the topic. Since he would not drink water from a pot, I went to the junkyard behind the local hospital, where there were all kinds of syringes. I filled one with water and aimed a squirt into Yahbo’s beak. Water would not pass down his throat. Drops trickled from his beak onto the dusty floor and coated themselves in dust, squirming and curling on the ground like miniature hedgehogs. I dropped all shyness with Yahbo, grabbed his neck and squirted into his beak, again and again, until his Adam’s apple went up and down without water spilling out of his beak. Afterward, he learned to drink from a pot of water. On hot days he soaked his legs and dipped his wings. He shook all his feathers, water flying around the attic. He dipped his head in the pot too. Yahbo was growing rapidly. I wanted to teach him to sit on my shoulder and to love me so he would not fly away into his forests, never to return. I wanted to walk with him on my forearm wrapped in ox hide. He would attack those who displeased him and pluck out their eyes with his talons, tear their ears off or at least pierce through them, making holes for earrings. It was already summer, and since there was no school, it was the busiest time of the year for soccer, biking, and reading. I often forgot to feed Yahbo for days. Suddenly remembering my neglect, I would run to the butcher’s. Even the hours I did have to train Yahbo I did not know how to put to use. I made a leather strap for my forearm. But Yahbo would not sit on it, growing irritated with my trying to place him there. A couple of times his beak started toward my eyes so I had to cast him aside. I am sure he had no sentimental impulses to kiss my ears or play with my hair locks—it was my eye he wanted to drink. I imagined I should take him out when he was starved and tease him with some meat on a whirling rope, and he would fly after it in circles, and learn to stay around me. But the taste of freedom, I thought, would be sweeter to him than blood. To Yahbo I was a jailer more than a friend. I could not talk to him. He would not look at me. His head was always tilted sideways so I didn’t know where he was looking. Perhaps he was looking at me, but I couldn’t tell, and that did not do much for communication between us. Nor did he trust me. When I walked into the attic, he would often fly from the front beam far back into the darkest recesses under the roof. But sometimes he flew from the recesses toward me and let me approach him if I moved slowly. I caressed him down his feathers, with a quickening sensation in my whole body. Petting Yahbo was like petting a sword with sharp double edges, a perfect smooth cold surface over which you glide your palms. But he was not cold, he was very warm and soft. He seemed quite pleased then, his eyes growing shiny, teary, radiant hazel. His head moved a bit to the left and a bit to the right; he probably did not know what to think; was I being affectionate toward him? As if to ask me what it all meant, he opened his beak, but no sounds came out. In the beak I saw his thin red and pointed tongue, almost a snake’s tongue. Overcome with sadness that he could not speak the language of humans, he stayed that way, his beak open, and the white film slid over his eyes like Venetian blinds. I often stayed in the attic for hours, just staring at the majestic bird. He was growing so large that I thought he might be an eagle. I doubted whether I could train him. It did not seem that he would want to be a servant. He was born to be a master, a count of the heavens, and who was I? Son of a clog-maker. How should I subdue this nobility? If he were a son of a banal human nobleman, I would gladly lynch him and humiliate him daily, make his nose bleed and tie him to a tree, a post of shame, the way I did with the mayor’s son. After I’d been there for a long while, Yahbo would fly the whole length of the attic, swing around and smash straight into the glass window. Five laths of wood made twelve square glass surfaces too small to be shattered like that. Yahbo would fall to the floor, stand up, fly back to the opposite end of the attic, and in a couple of minutes he’d be flying again, pointing his body straight to pass through the space between the laths. And he would crash again. In the morning he perched on the narrow ledge against the windowpanes, his beak open and uttering no sound, bewildered, perhaps not understanding what kind of air it was that would show you the wonders of your homeland and wouldn’t let you pass through, homeward. He faced east like a Muslim toward Mecca or a Jew facing Jerusalem; for him the glass was the Wailing Wall. Time and again he flew against the window so mercilessly I was scared he would break his neck. His eyes glowed with wrath. I was tempted to open the window for him, but did not. He needed fresh, winged food. When my cat caught a sparrow, I stole it from her. I threw the croaking, shivering bird toward Yahbo, and Yahbo missed it, unprepared for hunting out of the blue. Then he swooped down at the quarry, picked it up and wildly flew with it around the attic several times, whereupon he landed on his favorite crossbeam, nailing the sparrow with his talons to the wood. He stood, dignified, with his head in profile, as if ready to be minted into a silver dollar or a German mark, or some other aggressive country’s currency. Blood dripped from the beam onto the floor. Then Yahbo tore into the bird, his smaller nephew with the same color and same stripes as his own, and devoured it all, feathers, bones, eyes, everything, gulping hastily, his throat and eyes bulging out, and when his Adam’s apple leaped over the last swallow, he seemed to regret that the pleasure was so short-lived. Yahbo spread his wings like big arms of welcome. He opened his beak; his eyes increased in size and shot a beam of light; his snake tongue popped out. Then his body shook as if he were an alcoholic in delirium tremens. He opened his beak and vomited a chunk of feathers and blood. He cast another pallet. I ran downstairs to my mother in the kitchen. She chopped cloves of garlic and tossed it into the boiling water with egg whites and charcoal bread. I put the soup in a syringe and spurted it into Yahbo’s beak. He suffered it, now and then closing his beak to swallow and then opening it again, apparently asking for more. Knowing that Yahbo needed fresh kill, I borrowed a rifle from a Hungarian boy, Janosh, with whom I fought nearly every day. I would hit him on the mouth, so his lips would be cut against his rabbit teeth; he’d fling chunks of coal, crushing my toes; I’d chase him through half the town, and, catching him by his long hair, choke him while he plunged his nails into my back until his hands grew weak and he seemed to swoon. Fearing for his safety, I’d release him, and he’d spring up and run away shrieking unprintable text. We were actually very good friends, and he lent me his rifle gladly. I tiptoed into the beech forest, where I saw a weasel not far from me. I held my breath, slowly leaning the rifle barrel against the cold, peeled bark of a birch. The weasel did not seem to notice me. I aimed for the neck. Thup! The weasel jumped several times like a wild horse being tamed. I thought it would fall to the ground. It jumped onto another tree, almost missing a branch. I reloaded the rifle and followed. I tripped over a stump. I never lost sight of the weasel—its redness struggling to get onto another tree. I shot, missed, reloaded, shot, missed, reloaded. The weasel seemed to be picking up strength. I leaned against a tree and pulled the trigger. The weasel shook. It stood in one place trembling but would not fall. I must have put five more bullets into it, and it continued trembling. Then a spasm passed through its body, and it shook no more. But it would not fall. Unsteadily I climbed up to the weasel. Its yellow fur was covered with blood, its neck torn, its eyes almost outside the sockets. I grabbed its bloody body and tore it off the branch and threw it to the ground. I slid down the beech bark and vomited. The green darkness grew darker and more radiant, and all I could see in the radiance was the red blood, screaming, like the blood of Abel, straight to God. I threw myself on the ground. I prayed to God, saying that I would never again kill any animals, except for mosquitoes, and ants that I was bound to step on—that I would never intentionally step on an ant, nor place, the way a friend of mine did, one ant’s head against the neck of another to see an ant in panic biting through a sister’s neck. I would beat a boy in my street for having bathed a cat in gasoline and set it on fire; I would beat a boy who lived two streets away from me, who had killed the black cat of a ninety-nine-year-old widow by putting it into the washing machine. I promised God I would do all that on the condition that He restore life to the weasel. I waited, opened my eyes, and there was the weasel, as dead as before. I prayed more. I hit the ground with my fists, many times, until I hit something cool and slimy and when I opened my eyes, I saw I had squashed a snail. The weasel was still dead. I stood up, rubbed my slimy and bloody palm against the bark of the tree and against my jeans, and realized I had not completed my prayer. I said, “Amen!” The wind rustled around, invisible and ubiquitous, and the leaves trembled as it passed. With my bare hands I dug into the soft black soil; the soil stuck beneath my nails. I buried the weasel. So I returned home empty-handed. Yahbo opened his beak, turned his head in many directions quickly, in expectation. I saw that if I was going to let Yahbo go, I should not hesitate. It was already mid-August, and the more time passed, the more difficult it would be for him to learn how to hunt. The following morning, with my bow and arrows, I pierced the carton of an empty box that had held sunflower oil bottles and put Yahbo into it. I tied a narrow sheet of tin around Yahbo’s right foot, having inscribed on it my name and address with a needle. We set out for the mountains, the way Abraham set out with Isaac, to slaughter him as a burnt offering to God. I did not have the donkeys, so I had to be the donkey myself. I hoped that Isaac would live, that an angel would stop my raised hand with a knife in it. We went through the park, past the vineyards in the hills, through a layer of beeches into an oak forest. On the way I saw no hawks and wondered how he would do, whether he would find any company. In a windless meadow, I opened the box. He jumped out awkwardly, more like a chicken than a hawk. He flapped with his wings vigorously, making a wind like a helicopter during take-off. He flew in a semicircle and perched on the branch of a bumpy cedar. Everything had changed now. He was free. I was merely a human with bare hands, and flap as much as I would, I could not fly. He hesitated, fearing perhaps that there was a glass barrier somewhere against which he would smash and then fall back onto the sandy floor of the stuffy attic. After several minutes of contemplating the forest and the sky, he sprang from the branch. He flapped up in circles, higher and higher, spiraling into the heavens. High above me he glided on a new wind, keeping his wings still for a long time. Then he made a circle out of which he darted straight for the mountain. Every day I went to the attic and through the eastern window I stared toward the mountain, and wondered where he was in the emerald temple. During thunderstorms I feared a lightning bolt would strike him because of the metal I had put on his right leg. It is said that friends are one soul in two bodies. Well, that one soul was not in me; it was circling somewhere above the trees over the mountain. Two weeks later a local forester came by and told me that his dog had found a most peculiar thing: a dead hawk with a dead weasel in its talons. The hawk’s talons were sunk in the hips of the weasel; the hawk had missed the neck he must have aimed for. The weasel’s teeth were still in the hawk’s breast. The forester gave me the entwined bodies. I made a hole beneath the cedar to which Yahbo had flown. The tree roots were wiry and tough to cut through with my stone-age tool, a sharp stone. Among the roots I placed the thin limp mess of fur and dark blood of the weasel, for there it belonged. Then I collected dry branches of trees, made a bundle on the ground, and put the limp chunk of feathers, flesh, beak, talons, and dark blood over it. The white film covered his eyes. From my pocket I took out the Psalms on thin fine paper. I crumpled the pages, set them under the pyre, and struck a match. The branches caught fire at once, crackling. The feathers smelled like a tire being burned. The flames fought through a thick layer of smoke and the smoke rose slowly. Some smoke touched my eyes, stung them; tears came out as if I had been gazing at a big naked onion. I took out a cigarette and lit it on the pyre. The circles of my smoke merged into Yahbo’s smoke, and our smoke merged into the sky. From Honey in the Carcase. Used with permission of Dzanc Books. Copyright © 2019 by Josip Novakovich.